Despite their highly aesthetic appeal and heavy gold weight Mexican gold bullion coins have not been in the investors’ or collectors’ spotlight for the last couple of decades. Gold investors’ interest had been focused on many other 1 oz gold bullion coins like South African Krugerrands, American Golden Eagles, Canadian and European bullion coins despite their premium charges that were considerably higher than when purchasing Mexican Libertads or any other Mexican gold coins. However, the times are changing for Mexican gold coins value due to recent economic downturn and many individuals and corporations switching their investment strategies to create a solid recession proof portfolio while being extremely cost conscious. Now there seems to be no better choice than investing into Mexican gold coins value because of considerably lower seller premiums and higher gold weight per coin that allows you to maximize your gold value over spot price of gold ratio. When evaluating Mexican gold coins value, keep in mind that older mintages like, for example, 1921 and 1931 might come with a higher prices tag of Mexican gold Centenario due to added historical significance and rarity factors. 50 Mexican gold pesos coin weighs in at 37.5 grams of gold. 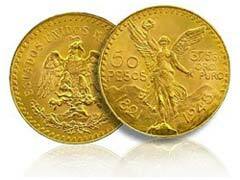 This is considered the largest gold bullion coin that could be purchased today at the market. These coins are also called Centanarios and were first issued in 1921 to mark the 100th anniversary of Mexico’s freedom from Spain. Modern day Mexican gold bullion coins are called Libertads and come in a variety of denominations ranging from 1/20 of an ounce to a full ounce allowing you to select the right gold bullion coins for your investment portfolio. In attempts to maximize Mexican gold coins value and your investment value over price of gold ratio, keep in mind that it’s always a better choice to purchase 1 oz gold bullion coins from one reputable source vs. buying smaller denomination coins from multiple dealers. The later choice might result in you incurring more premium charges on your gold coin investment.